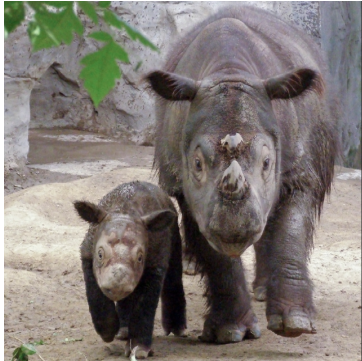 Another piece of good news - this time related to the Sumatran rhino and reported on Mongabay.com. Using remote camera traps, wildlife rangers confirm the Sumatran rhino (Dicerorhinus sumatrensis) still inhabits the Leuser ecosystem in northern Sumatra, making that forest the only place on the Earth where Sumatran tigers, orangutans, elephants, and rhinos survive in a single ecosystem, though all remain Critically Endangered. The ongoing survey, funded by the U.S. Fish & Wildlife Service (USFWS) and undertaken by the Leuser International Foundation (LIF), has so far revealed that at least seven and up to 25 Sumatran rhinos survive.